Pantethine is a highly absorbable and biologically active form of pantothenic acid (Vitamin B-5). Pantethine forms the reactive component of Coenzyme A (CoA) and the acyl-carrier protein (ACP). CoA and ACP are extensively involved in carbohydrate, lipid and amino acid metabolism. In addition to possessing the metabolic activity of pantothenic acid, Pantethine helps to support healthy serum lipid levels already within the normal range. 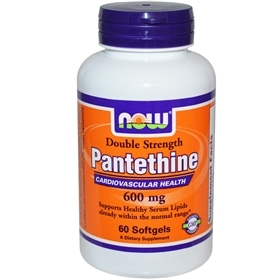 Pantethine is also important for healthy cardiovascular function through its antioxidant activity. It is vital for dozens of enzymatic reactions that require coenzyme A, including those involved with processing fats and carbohydrates. It also helps the cells’ energy factories, the mitochondria, turn fatty acids into energy to help improve energy production in every cell of the body. It supports healthy adrenal cortex function and hormone synthesis, especially during times of stress, which is why it is known as the “anti-stress” B vitamin. A deficiency in pantothenic acid can lead to atrophy of the adrenal glands with symptoms of fatigue, fogginess, and sleep disturbances. Pantethine also lowers cholesterol naturally which lowers cardiovascular risk. Pantethine is also an excellent choice when it comes to reduction of triglyceride in the body. Pantethine's role in optimum heart health cannot be under-estimated. By generating more Co-enzyme A, the heart muscle's metabolic rate is enhanced, thereby increasing the heart contractile forces, and with a stronger contraction, a longer relaxation phase is possible, resulting in the slowing of heart rate. In addition, pantethine also helps to increase the production of omega-3 fatty acid in the body ( EPA, DHA, and other essential oils). Omega-3 fatty acids also have powerful anti-inflammatory effects and reduces the clot promoting fats in cell membranes. Pantethine is also an excellent nutrient when it comes to colitis and Crohn's disease. A daily dose of 900-1200 mg matched with 900-1200 mg of pantothenic acid will drastically improve those with Crohn's disease and colitis.Results are seen in 4 to 8 weeks, but many have reported benefits in much shorter time. Pantethine also helps beneficial bacteria to grow in the intestines. It helps the body get over yeast overgrowth and accumulation of other toxic substances such as formaldehyde, so pantethine is therefore a natural detoxifier. Suggested Usage: As a dietary supplement, take 1 softgel 1 to 2 times daily, preferably with meals. For maximum utilization use this product with other NOW® B-Vitamins.